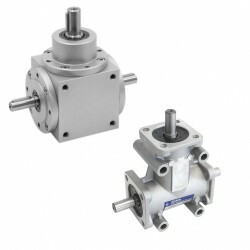 The series Standard Gear Units includes the Standard Worm Gearbox, N-Worm Gear Unit-light version and the Standard Bevel Gear Units in the heavy-duty and light version. ATLANTA Standard Worm Gear Units have been designed for use with three-phase motors and servo motors. Due to the great number of attachment and threaded holes provided it can be directly installed in any desired mounting position without any preparatory work being required. 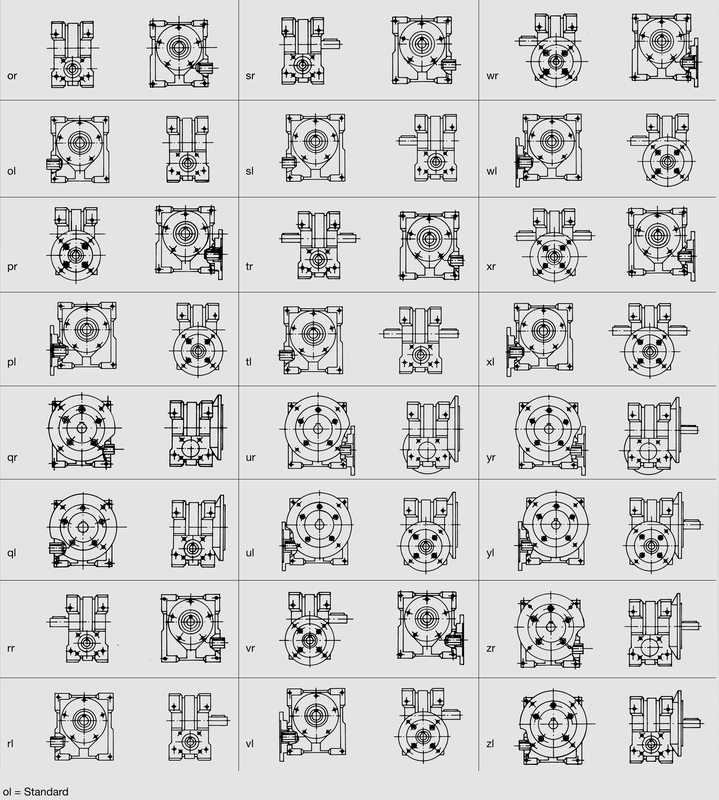 The basic gear with solid input shaft or with hollow input shaft can be mounted in 24 different designs, see unit mounting possibilities of Standard Worm Gear Units. A precondition for the self-locking quality of gear units is a small tooth lead angle of the worm and thus an efficiency of η ≤ 0,5 with worm driving. Consequently self-locking gear units are generally uneconomical when high performances and long operating times are required. A worm gear unit is considered self-locking at standstill if, with worm wheel driving, starting from standstill is impossible. This is the case with ATLANTA wheel sets and gear units when the lead angle is <5°. A worm gear unit is considered self-locking from the running condition if the gear unit comes to a standstill whilst being backdriven. This is only possible with high gear ratios and very low speeds. Shocks and vibrations can neutralize the self-locking capacity! Therefore a self-locking tooth system cannot replace a brake or reverse-stroke locking mechanism. In order to avoid overstressing of the worm gear drive due to the very high kinetic energy involved, you should furthermore allow for a certain running-down time after stopping the input. Operation and Maintenance Instruction of Standard Worm Gear Unit. 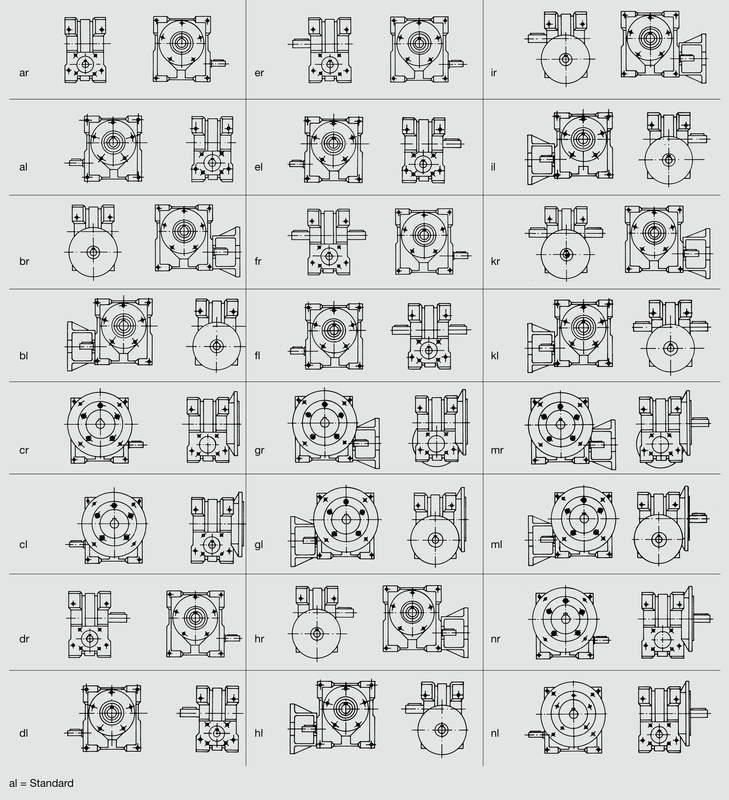 Our Standard Bevel Gear Units are suitable for all types of applications for rotating and positioning and can be used in every situation and orientation. The heavy-duty version with three transmission shafts has centering diameters for precise alignment. 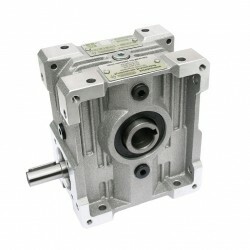 This version has a robust aluminum or cast iron housing, hardened and lapped bevel gears with spiral teeth. The light-duty version has a single-block housing made of aluminum and is machined on all sides. It si provided with adequate mounting holes for installation in any position desired. The hardened and lapped spiral bevel gears ensure good operation in both directions of rotation.